Dr. Jeff J. Mollins, Doctor of chiropractic, has been practicing in Downtown Brooklyn for over 25 years. In that time, he has successfully treated countless patients that range in age from five years old to ninety-five. Dr. Mollins specializes in the diagnosis, treatment, and documentation of patients who are injured in accidents. These accidents include construction accidents, automobile accidents (no-fault), slip and fall accidents and work related accidents (workers compensation). Many of the injuries sustained in traumatic accidents can be successfully treated by chiropractic care. Chiropractic is a health profession concerned with the diagnosis, treatment and prevention of mechanical disorders of the musculoskeletal system, and the effects of these disorders on the function of the nervous system and general health. Chiropractic is based upon understanding that good health depends upon a normally functioning nervous system. Chiropractors focus on the correction of the skeletal and neurological systems of the human body resulting in proper function, elimination of pain and improved health. Unlike drugs or surgery, which focuses on symptoms, chiropractic addresses the underlying causes that have reduced the body to a weakened, pained state. Once these problems have been identified and corrected, pain is eliminated, but more importantly, the body works properly. Initially our patients are asked to complete very specific paper work. 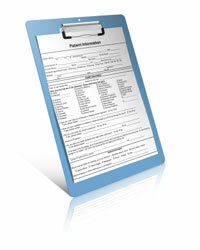 Paper work is extremely important because patients who are involved in accidents must have accurate documentation. For example, a patient involved in a motor vehicle accident (no-fault) will be asked to complete a no fault application. A patient injured on the job must fill out a worker’s compensation questionnaire which asks who they work for, their specific job duties, and are they physically capable of working. Dr. Mollins will then take a careful history. History is extremely important in determining how an accident happened and also if this patient has ever had any pre-existing conditions. The patient will be asked about the current complaint, whether there is any current or past chronic health problems, family history of disease, dietary habits, medical care received and any medications currently being taken. Details of how the injury occurred should be taken. The next step is to perform a thorough examination on the patient. Our examination consists of a complete neurological and orthopedic examination which will also contain postural analysis, complete range of motion, and palpation of the spine. It is possible that x-rays of the spine will be taken (not in all cases) and also MRI study as well. Once a proper working diagnosis is assessed, Dr. Mollins will then place the patient on a course of treatment. Treatment consists of spinal manipulation also called an adjustment. A chiropractic adjustment is performed using the doctor’s hands over the area of the spine that has lack of mobility. By applying specific gentle force, Dr. Mollins is able to regain range of motion and decrease pressure over the area treated. An adjustment is painless and the patient will typically feel much better after the manipulation is performed. The patient usually will say it feels like a weight has been taken off that area of the spine or they feel “lighter”. Dr. Mollins has been in practice for over 25 years and is an expert at performing chiropractic adjustments. Chiropractic adjustments are also used in conjunction with exercise and various forms of physio and physical therapy (moist heat, electric muscle stimulation, ultrasound, etc.). Our treatment is extremely comprehensive and beneficial to the patient. The number of chiropractic treatments will vary depending on several factors. Generally long-term treatment is needed for conditions that are chronic, severe, or occur in conjunction with another health problem. Patients who sustain severe injuries (serious car accidents or work accidents) may also have longer healing time. Some injuries will inherently require more treatment than others in order to get relief. Dr. Mollins is an expert. He is an expert chiropractor, practicing more than 25 years in downtown Brooklyn. Remember if you are hurt on the job, you can be treated at no cost and receive compensation for lost wages (if unable to work) provided you go to a certified workers compensation doctor. When you return to work you can continue to receive treatment at no cost. Dr. Mollins has been certified to treat workers compensation patients since 1983 to the present (workers compensation #C03541-2). He and his talented office staff are also experts at documentation and timely, accurate submission of paper work so that our patients receive needed treatment and proper compensation for their lost wages. In addition, Dr. Mollins works closely with referred specialist (orthopedics, neurologist, pain management, physical therapist, acupuncturists, psychologist, etc.) who are also workers compensation certified and adept at submission and preparation of all paper work. Why not go to the best? Dr. Jeff J. Mollins provides quality, compassionate, and comprehensive care for all of his patients.